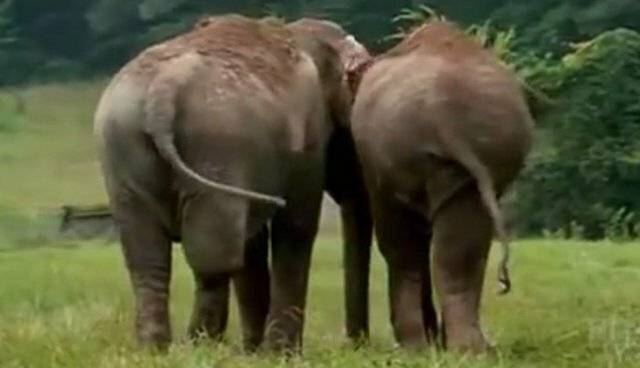 Make sure you have a tissue handy when you watch what happens when Shirley and Jenny, two crippled elephants, are reunited for the first time in 22 years at the Elephant Sanctuary in Tennessee. The two former circus elephants are elated to see each other and it is one of the most heartwarming and unforgettable reunions I’ve ever seen. “Jenny came into the barn for the first time since Shirley’s arrival at around 7:00 p.m. There was an immediate urgency in Jenny’s behavior. She wanted to get close to Shirley who was divided by two stalls. Once Shirley was allowed into the adjacent stall the interaction between her and Jenny became quite intense. Jenny wanted to get into the stall with Shirley desperately. She became agitated, banging on the gate and trying to climb through and over. After several minutes of touching and exploring each other, Shirley started to ROAR and I mean ROAR—Jenny joined in immediately. The interaction was dramatic, to say the least, with both elephants trying to climb in with each other and frantically touching each other through the bars. I have never experienced anything even close to this depth of emotion”. From that point forward the two elephants were inseparable and spent many wonderful years together.